US, UK and Canadian Regionals have ended. Two decks stood head an shoulders above the others. One is combo, the other aggro. This week I’ll look at the best combo deck out there – Dragonstorm. I’ll also take a look at a couple other combo decks that also abuse the storm mechanic. Let’s start with the big dog. If you have played any competitive Standard in the last year, you have probably seen this. You probably also know what the deck does – it cast a bunch of mana acceleration spells, then casts Dragonstorm, gets three or more copies via storm, then fetches four copies of Bogardan Hellkite and domes you for twenty. And it does that early and often in many, many matches. The Dragonstrom decklists are pretty uniform. Adam Gendelman played this fairly stock Dragonstorm list to a first place finish in the Connecticut Regionals. 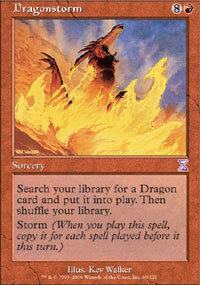 Dragonstorm has a god draw: Mountain, Rite of Flame, Rite, Rite, Seething Song, Dragonstorm, gg. That’s a nice turn one play, but you won’t draw it very often. What is fairly common, however, is suspending a Lotus Blossom on turn one, then going off on turn four. The deck is not all about ramping up to a Dragonstorm. Sometimes, you end up playing a Hellkite alone, and riding that to victory. This is quite common in control matches – you play the Hellkite as an instant, either during your opponent’s end step as a way to draw counters, or in response to your opponent tapping out to do something else, like cast Mystical Teachings. Most of the deck is self-explanatory. The Hellkites are your primary kill. The Hunted Dragons and/or Tarox Bladewings are there in case you draw one or more Hellkites, since Dragonstorm isn’t Tooth and Nail – you can’t get dragons that are stuck in your hand. The main difference is that the Hunted Dragon does six damage, so if you get three Hellkites (dealing 5 points each to the opponent) and a Hunted, you can still win that turn. Tarox only does four, for a total of 19. However, if you have to hardcast a dragon, then beat with it, Tarox does a far better job of racing. Sleight of Hand and Telling Time are around simply to dig through your deck for combo pieces. 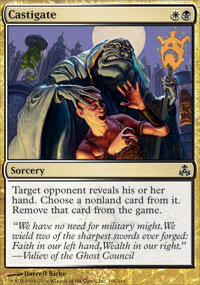 Remand, in effect, does the same thing: it’s primary purpose is to buy you one more turn and to draw another card. Gigadrowse is the one purely defensive card in the deck. It can slow attackers, but it’s main purpose is to tap out a counterspell wielding opponent at the end of his/her turn, to allow you to go off on your turn. This is critical, because although a single counterspell won’t do all that much against Dragonstorm (and all it’s storm copies), a single counter on, say, a Seething Song can mean you end up with only 7 mana in your pool – and Dragonstorm costs more than that. The Dreadship Reef and Calciform Pools are there to build up storage counters that can convert into blue mana. The counters can power a large Gigadrowse later in the game. They can also help cast dragons and Dragonstorm, if necessary. Although this deck runs just two copies, I have seen decklists with significantly more. Dragonstorm had more appearances in US Regionals Top Eights than any other deck (24 of the 158 decklists reported), and was just behind Gruul worldwide. It has been on top of the MTGO Standard metagame for a long time (although it dipped a bit last week.) It will be back. The result of being this good is that a lot of decks have sideboard (or even maindeck) hate for the deck. Here are some of the most common answers. CoP: Red can, with enough mana, completely shut off the damage from the dragons indefinitely. It can certainly shut down the damage long enough to get rid of the dragons with a Wrath of God or Damnation. However, Circle only works if you have mana to power it – and a Gigadrowse at the end of your turn can mean that you cannot power the CoP the turn your opponent goes off. 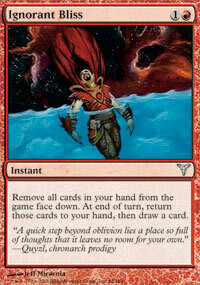 Beatdown decks, like Zoo, often try Temporal Isolation. Isolation can be cast as an instant, with the Bogardan Hellkite’s 5 damage ability on stack, and it will prevent that damage as well as eliminating it from combat considerations. Castigate is the best targeted “discard” currently available. It can rip critical pieces out of the Dragonstorm player’s hand. It is also nice against decks like Dralnu (where it can prevent Mystical Teachings from being flashed back) and against Dredge (since when a Stinkweed Imp is removed from the game, it doesn’t dredge anything.) About the only downside is that Castigate required both black and white, which limits it to certain decks. Hide // Seek – specifically Seek – is a super-techy answer to Dragonstorm. If you can cast it before they go off, you can remove one of their Bogardan Hellkites from the game, with the bonus that you gain enough life as a result that they cannot kill you quickly with what’s left. That generally gives you enough time to win, or at least stop the beats. (I just noticed that I have begun talking about the sideboard user in first person, and the Dragonstorm player as the opponent. That’s mainly because I generally don't play Dragonstorm in tournaments. At Regionals, I played a GBW Glittering Wish Control deck. My anti-Dragonstorm package consisted of maindeck Castigates, Persecutes and a Hide//Seek to fetch with Glittering Wish. Shadow of Doubt is, in theory, a perfect answer to Dragonstorm. When the Dragonstorm player casts his signature spell, you cast this in response. Once this resolves, no matter how many copies of Dragonstorm resolve, since the opponent cannot search his/her library, no dragons will appear. You can even draw a card. The downside, of course, is that this only works if you have the mana to cast it, and Dragonstorm plays Gigadrowse solely to stop cards like this. The Mindcemsor is a flying version of Shadow of Doubt. It has the advantage of being useful (at dealing two damage a turn) even when it is not stopping Dragonstorm. The downside is that it does not prevent the search – it just limits searches to the top four cards. If the opponent finds a Hellkite in the top four cards, that Hellkite will kill the Mindcensor and the rest of the strom copies will resolve anyway. Even if the Dragonstormer does not find a dragon in the top four cards in the first search, he still shuffles his library after the search, so he may find one the next time. Rewind is another counterspell. However, it is the untap ability that matters in this case. 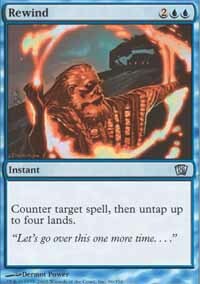 Rewind is not usually critical in countering a Dragonstorm; it is critical in countering the last EoT (or second to last) copy of Gigadrowse, thereby untapping enough lands that you can counter critical mana acceleration the next turn. Dralnu verses Dragonstorm games often come down to an EoT Gigadrowse, the Dralnu player floating six mana, then countering the second to last Gigadrowse with Rewind, and Remanding the Dragonstorm player’s Remand (or the last Gigadrowse copy if the Dragonstorm player has no Remand. All of the above answers are white, black or blue. The other two colors have fewer answers. Gruul, in particular, does not spend a lot of time trying to interfere with Dragonstorm – it just tries to deal 20 damage before the Dragonstorm player can go off. 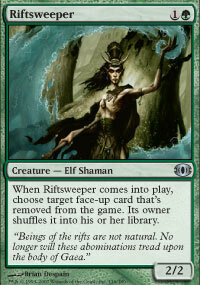 However, some Gruul decks are now experimenting with Riftsweeper. Riftsweeper’s main function is to get rid of suspended Lotus Blossoms, which can set back Dragonstorm a turn or two. That it, in theory, all Gruul needs. Gruul decks have also experimented with other spells and answers, including Cryoclasm and other land destruction spells, and (Parallectic Feedback). Personally, I have never had great success with either – I find simply trying to kill them first is more effective. I will try Riftsweeper in my Gruul deck, however. 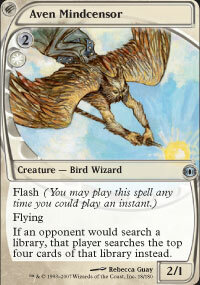 Riftsweeper is also quite good against other widely-played suspend creatures, like Aeon Chronicler and Detritivore. Ignorant Bliss is the deck’s patent answer to Castigate, Persecute or anything else that tries to strip critical combo parts out of it’s hand. The card works wonders, and would be playable even if it were not a cantrip. In general, this card comes in for Gigadrowse when playing against non-blue decks or even Solar Flare (it’s only counters are Remands), and various other cards against decks like UW Control, Pickkles and Dralnu. The Martyrs come in against weenie beatdown decks, and especially against the new Bridge from Below decks. The Bridge decks try to produce a ton of tokens by flashing back a Dread Return. However, if the Dragonstrom player sacrifices the Martyr in response to Dread Return, the Bridge from Belows are removed from the game, and the zombie tokens are not produced. Teferi, Mage of Zhalfir and Word of Seizing are anti-control cards. Word of Seizing is particularly good: if a Dragonstorm player steals the opponent’s Teferi, the opponent cannot cast instants, or anything else, to disrupt the Dragonstorm player from going off. Dragonstorm is still the best, most consistent and most resilient storm combo deck around. However, several other storm decks have appeared over time, and with more recent versions taking advantage of the new Future Sight cards. The oldest of these, at least the oldest that I am familiar with, is Splitting Headache, popularized by Zac Hill on StarCity Games back in November. It simply tries to up the storm count, then swing with Goblins or burn the opponent out with Ignite Memories. Splitting Headache does not have the pure power of Dragonstorm, but it can be faster. More importantly, it does not search for dragons, so answers like (Hide // Seek) and Aven Mindcensor do not disrupt the combo. Personally, the only reason I could ever find to play this was because I didn’t have four Dragonstorms. It’s a nice deck, but it falls into the “second best combo deck around” hole – and that’s a place I generally avoid. 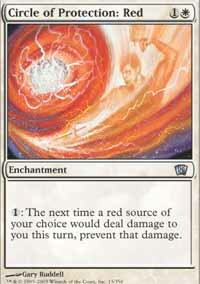 * Splitting Headache does dodge some of the Dragonstorm hate, but it is similar enough to Dragonstorm that opponents know how to play against it, and it does not have answers like Gigadrowse and Remand. Splitting Headache also is not all that much faster than Dragonstorm. However, players looked hard at the storm cards in Splitting Headache, and developed a newer version that included some of the card drawing Splitting Headache was missing, and managed to increase the storm count and power as it went. The new version featured what was a crap rare – although it is a bit more expensive now. Nathan Kelly took first place at the Nova Scotia Regionals with this version of the Hatching Plans storm deck. The advantage of this deck is that it can do a ton of card drawing (Perilous Research sacrificing Hatching Plans = five cards), and can create a really high storm count. Plays like Claws of Gix, Remand Claws, replay Claws, Repeal Claws, replay Claws give you a storm count of five and draw you two cards – all for the low mana cost of 1UU. The deck is very fast and reasonably consistent. The downside is that it needs to kill with either a hoard of Goblins or a storm of Ignite Memories. The goblins can be destroyed with Wrath or Damnation, or cards that provide -1/-1, like Crovax and Orzhov Pontiff, or swept off the board with (Crime//Punishment). The Ignite Memories is faster, but useless against decks that empty their hand. You can even survive huge Ignite storms by holding extra lands in hand, and having the lands randomly chosen Ignite after Ignite. Finally, Billy Moreno and BDM have cooked up an even faster version of this combo deck. Here’s what I’m playing around with at the moment. 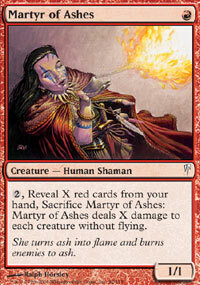 It abuses a number of cycling cards, including cards like Edge of Autumn and, originally, Street Wraith. The deck can do dumb things, and it has enough card drawing to get through most of that. The only downside is that the kills are not a lot better than Splitting Headache – although a large Storm Entity is a nice addition. The most amusing thing about this deck is that, although it could, in theory, cast Edge of Autumn, it has not lands the spell could find. 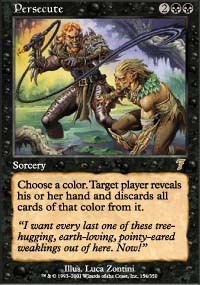 Edge of Autumn is the solely to cycle in search of better cards. However, if you use a Flagstones of Trokair to pay for the cycling, that is not much of a disadvantage. Flagstones is also a fun land to sacrifice to Claws of Gix or Perilous Research. This deck is a ton of fun to goldfish. I am not sure how well it actually will do in tournaments, however. It has to do a lot of card drawing to find the combo pieces, and even though a lot of that card drawing is fast and cheap (e.g. Baubles), it does take time and mana to do that. During that time, your opponents may just kill you. Even if he doesn’t, you are just getting Goblins and / or a pile of Ignites. Of course, you can easily get a half dozen copied both spells onto the stack on the same turn – and an early turn at that. Fun deck, though. Give me another couple hours of testing and I’ll decide whether I wan to spend TIX for a chance to pilot it in tourneys. Right now, I’m not sure. * Usually because I am busy playing my own homebrew combo decks, which are more like “seventeenth best combo deck in the format,” but at least I can claim some proprietorship, and because, generally, no one knows what I am doing early enough to stop me from winning. love storm. love the article. however i feel you neglected to mention what i feel is the best dragonstorm hoser. EXTIRPATE. uncounterable and stops them dead. also try combining you storm deck with the oni of wild places avatar for some vanguard fun be sure to add BOP elves and ornothoper to up that storm count. I agree with you on the "ton of fun to goldfish" my testing versus decks online has been less suscessful. I think it is a very hard deck to play correctly (as opposed to say Dragonstorm) and punishes you for small mistakes. Personally while it's a blast to play I don't think I'd run it in tournements.